Kick off your shoes—you won’t need them while you’re here! Looking for a private, quiet, spacious, and rejuvenating Cape Cod getaway spot? 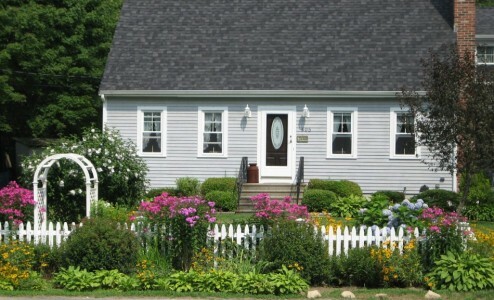 Come stay a week at the Cape Bay Guest House! Step into our lush gardens and through the front door of your own private home in a quiet neighborhood just a short stroll down the hill to the beach. Grab your towel, some sunscreen, and go! No need to hunt for parking—you’ll walk right on to a lovely, quiet harbor beach with swimming, boating, and gorgeous views of Mashnee Island and beyond. Cape Bay Inn and Guest House is a gracious, spacious, and luxurious “home away from home” nestled in a residential area of Monument Beach village in Bourne, MA—the Upper Cape’s gateway to a variety of local attractions and destinations. We are located just up the hill from a lovely, secluded harbor beach where sunbathing, swimming, volleyball, and boating activities await you. Landlubbers? Some of the area’s most sought-after golf courses, shopping, and dining are minutes away. We rent by the week; bring the family (we can accommodate up to 6 guests)! The Guest House is comprised of three spacious bedrooms (two with queen beds, and one with two twins), two bathrooms, a spacious living room, and a lovely lofted kitchen with long trestle table to fit the whole family and a cozy fireplace (for “looks”—you won’t need it! ), and a variety of “Olde Cape Cod” artifacts. We’re sorry – we can’t accommodate your four-footed family members (we’ll be happy to provide you with a list of highly-recommended kennels and pet “spas” nearby!). Each room is decorated differently with inviting, relaxing colors, plush bedding, and tasteful furniture. * Complimentary high-speed wireless Internet access is available throughout the Inn. * Bedrooms are equipped with air-conditioning. * Satellite Television, games, and books are available throughout the house for the occasional rainy day or lazy evening in. Air conditioning; satellite TV; complimentary high-speed wireless internet; linens and bedding; kitchen; outdoor shower; porch and gas grill. * When you reserve your stay, you will be required to submit a signed lease and a deposit equaling 50% ($725.00) of your weekly rate. Deposit is fully refundable if you cancel within 14 days of your stay. Failure to cancel within 14 days will result in the loss of your deposit. * Upon booking, you will be asked to sign a short-term rental lease and submit a security deposit of $500, which will be returned to you within 1 week of your stay (unless damage has been detected per the terms of your lease agreement). Rents by the week: Saturday to Saturday throughout the summer and fall (approximately May-October). Call us for availability!